This football sports art painting captures the retro look of a vintage quarterback is approximately 48” x 87” acrylic on unstretched canvas. 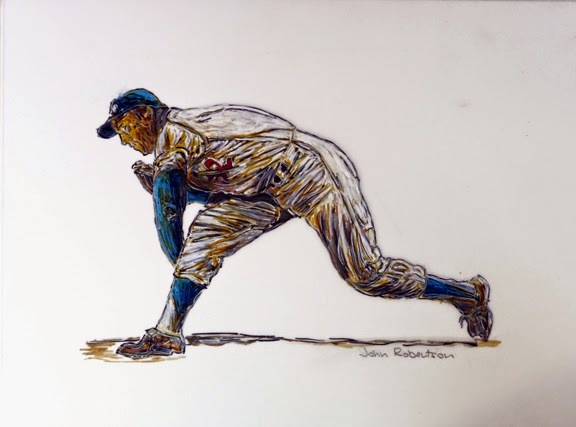 This sports art painting is of a left-handed baseball catcher. Approximately 54” x 71” acrylic on unstretched canvas. Image of a hand holding a baseball in the manner in which a pitcher would grip the ball to throw a curveball. This large scale baseball paint is approximately 51” x 69” acrylic on unstretched canvas. Image of a hand holding a baseball in the manner in which a ptcher would grip the ball to throw a screwball. The baseball screwball pitch grip painting is 50” x 67” acrylic on unstretched canvas. This means no stretcher bars or frame. Image montage tribute to Hank Aaron of the Atlanta Braves. This large scale baseball painting is approximately 72” x 72” acrylic on unstretched canvas. This means no stretcher bars or frame. This large scale football painting of Aaron Rodgers quarterback of the Green Bay Packers is approximately 48” x 72 acrylic on unstretched canvas. The cost of a piece depends on a variety of factors – size, subject matter (meaning the particular sport, how many figures in the painting,) materials, etc. You do not see a "buy link" on the images as I prefer to work directly with the client for a personal experience. Almost all of my work is large-scale generally starting as 5 feet by 6 feet, acrylic on unstretched canvas. (that means no stretcher bars or frames.) The paintings generally hang much like a tapestry or banner. Some clients do have them framed. The sizes go up to 8 feet by 15 feet with a variety of sizes in-between depending on the space allocated for it’s hanging. Large scale Football Art on the wall of a client's home. I can create paintings to fit specific needs, including smaller work. The smaller work I create is generally using old sports magazines and newspaper, attaching the material to gallery wrapped stretched canvas and creating a figure on the applied material. The piece is then lacquered for both the aesthetics and protection of the surface. 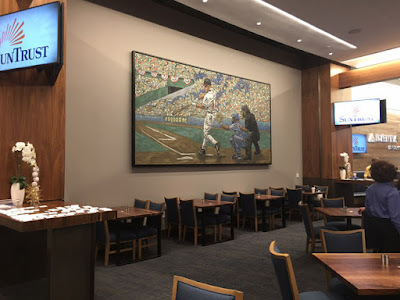 You may have already read on this site that my most recent sports painting project is paintings for the new Atlanta Braves Atadium in Atlanta, Ga and the remodel for the Green Bay Packers stadium, Lambeau Field. Both big projects were completed in 2017. Minnesota Vikings Football Stadium in Minneapolis, MN. You can see some of those paintings by scrolling through recent blog posts on th eblog. There is generally downtime between getting decisions made as the projects progress. Previous to these stadiums five large-scale paintings were created for the new San Francisco 49er’s football stadium (Levi Stadium) in Santa Clara, Ca. Owner's suite, San Francisco 49er's football , Levi's Stadium. I have created art for Fox Sports, Fox Sports Net, Prudential Sports Arena (home of the New Jersey Nets and the New Jersey Devils), the Amway Sports Arena, Orlando Florida home of the Orlando Magic. My art has been used in movies and on television shows and various other commercial projects. I also create images for private clients, television shows and various other commercial projects. The newest project will be creating work for the NBA Milwalkee Bucks teams, new basketball stadiu8m opening for the 2018-2019 season. Boxing painting Juilo Cesar Chavez hanging in Malibu, Ca home. Excample of a painting, of Joe Montana displayed in a client's office. This painting of a boy in a private home. Painting iof a client in a private home. When "borrowing" one of my images without my permission please have the courtesy to provide a credit to me for painting the image and provide a link to my blog.